A poor weekend of surf with no real swell left in the tank Saturday morning. Winds were light at dawn but gave into a stronger onshore change mid-morning and yesterday remained poor with no decent swell and fresh S/SE winds. Today a small weak of easing mid-period W/SW swell and SE windswell were offering average weak 2ft waves on the Surf Coast and 2-3ft sets to the east for keen surfers. This afternoon we should see a long-period signal showing on the wave buoys (just hit Cape du Couedic), generated by a strong but distant storm that developed west-southwest of WA late last week. The fetch was located in our western swell window and a little too far north than ideal, meaning the Surf Coast will suffer size wise. While already being inconsistent from the get go, the westerly direction will make it even more so on the Surf Coast with very infrequent 2-3ft sets due at swell magnets with not much in between. The swell is due to peak early in the day, easing into the afternoon. The Mornington Peninsula should hopefully see inconsistent 4-5ft sets and conditions are looking favourable for both coasts still with an early morning variable wind before a surface trough moves in from the west, bringing a stronger afternoon S'ly change. Wednesday will be poor as the swell drops away under a lingering S/SE breeze. Come Thursday we'll be looking at quite a funky setup with a small surface low expected to drift across our region through the morning. This is expected to bring NE winds through the morning, likely tending W'ly and possibly holding into the afternoon. 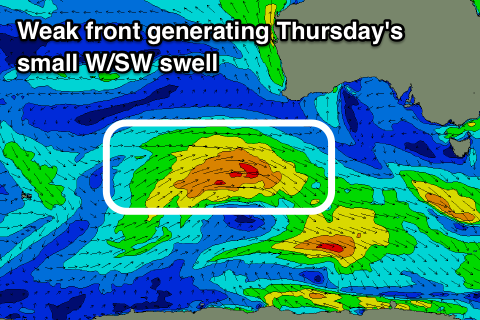 Size wise, a small mid-period W/SW swell should be in the water, generated by a weak front currently passing under WA. The Surf Coast will be 2ft max at the swell magnets though the Mornington Peninsula will hopefully offer 3ft to possibly 4ft sets. Friday looks clean again through the morning with a light N/NE breeze, but Thursday's swell will be on the way out with tiny waves on the Surf Coast and 2ft to maybe 3ft sets on the Mornington Peninsula. Overnight a front will move through bringing a SW change and small weak increase in W/SW windwell for Saturday, easing Sunday but with no quality surfing options at this stage unless the front upgrades in strength. A better long-range groundswell is on the cards for early next week with hopefully more favourable winds out of the north-eastern quadrant, but we'll have a closer look at this on Wednesday. Hey Craig, this morning some nice clean waves and a sea fog that started early, backed off, came back in. I just saw the reporting about NSW and inland Vic touching 40 degrees - what caused the fog this morning? It certainly made the surf fun, and now we are covered in cloud down here, so the day has been quite pleasant with good waves early and really quite nice mild temperatures.